A generating station in which diesel engine is used as the prime mover for the generation of electrical energy is known as diesel power station. 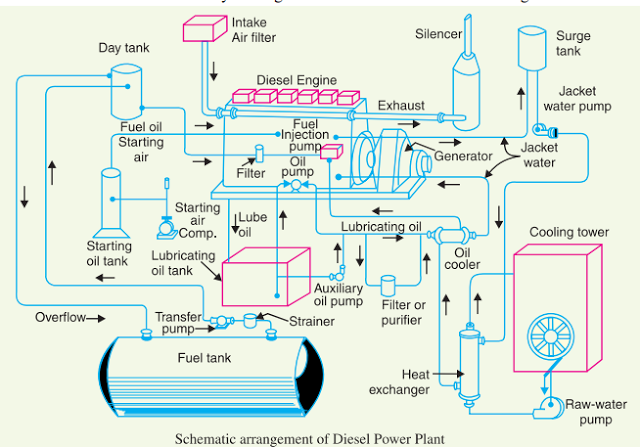 In a diesel power station, diesel engine is used as the prime mover. The diesel burns inside the engine and the products of this combustion act as the “working fluid” to produce mechanical energy. The diesel engine drives the alternator which converts mechanical energy into electrical energy. As the generation cost is considerable due to high price of diesel, therefore, such power stations are only used to produce small power. Although steam power stations and hydro-electric plants are invariably used to generate bulk power at cheaper cost, yet diesel power stations are finding favour at places where demand of power is less, sufficient quantity of coal and water is not available and the transportation facilities are inadequate. These plants are also used as standby sets for continuity of supply to important points such as hospitals, radio stations, cinema houses and telephone exchanges. (i) The design and layout of the plant are quite simple. (ii) It occupies less space as the number and size of the auxiliaries is small. (iii) It can be located at any place. (iv) It can be started quickly and can pick up load in a short time. (v) There are no standby losses. (vi) It requires less quantity of water for cooling. (vii) The overall cost is much less than that of steam power station of the same capacity. (viii) The thermal efficiency of the plant is higher than that of a steam power station. (ix) It requires less operating staff. (i) The plant has high running charges as the fuel (i.e., diesel) used is costly. (ii) The plant does not work satisfactorily under overload conditions for a longer period. (iii)The plant can only generate small power. (iv) The cost of lubrication is generally high. (v) The maintenance charges are generally high. (i) Fuel supply system. It consists of storage tank, strainers, fuel transfer pump and all day fuel tank. The fuel oil is supplied at the plant site by rail or road. This oil is stored in the storage tank. From the storage tank, oil is pumped to smaller all day tank at daily or short intervals. From this tank, fuel oil is passed through strainers to remove suspended impurities. The clean oil is injected into the engine by fuel injection pump. (ii) Air intake system. This system supplies necessary air to the engine for fuel combustion. It consists of pipes for the supply of fresh air to the engine manifold. Filters are provided to remove dust particles from air which may act as abrasive in the engine cylinder. (iii) Exhaust system. This system leads the engine exhaust gas outside the building and discharges it into atmosphere. A silencer is usually incorporated in the system to reduce the noise level. (iv) Cooling system. The heat released by the burning of fuel in the engine cylinder is partially converted into work. The remainder part of the heat passes through the cylinder walls, piston, rings etc. and may cause damage to the system. In order to keep the temperature of the engine parts within the safe operating limits, cooling is provided. The cooling system consists of a water source, pump and cooling towers. The pump circulates water through cylinder and head jacket. The water takes away heat form the engine and itself becomes hot. The hot water is cooled by cooling towers and is recirculated for cooling. (v) Lubricating system. This system minimises the wear of rubbing surfaces of the engine. It comprises of lubricating oil tank, pump, filter and oil cooler. The lubricating oil is drawn from the lubricating oil tank by the pump and is passed through filters to remove impurities. The clean lubricating oil is delivered to the points which require lubrication. The oil coolers incorporated in the system keep the temperature of the oil low.